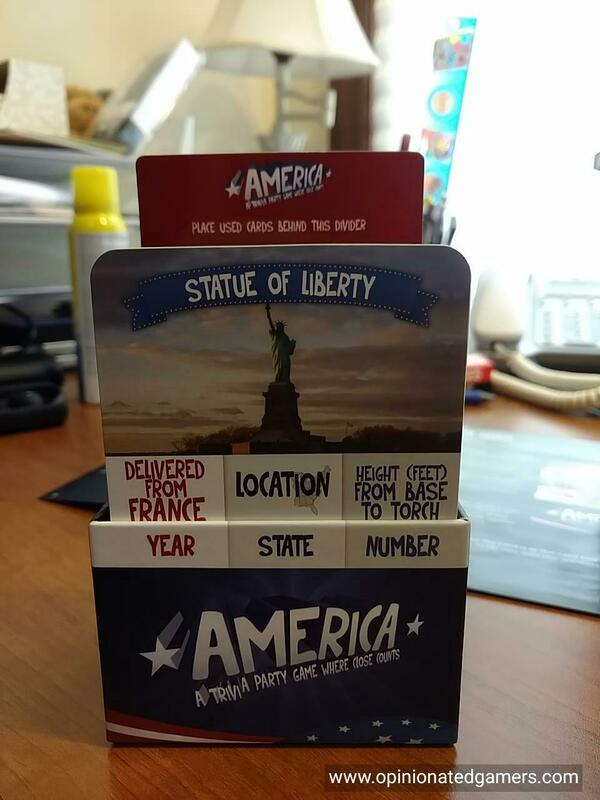 America is the new release from Bezier Games, the newest release in the Fauna family of games. I have been a big fan of Fauna – well, maybe not since the very beginning… but definitely from August 2009 onwards! The reason for this is that I first learned about Fauna when I started doing research about the 2009 Spiel des Jahres finalists. I played a role in the development of Dominion, the eventual winner of the 2009 SdJ, and I must say that I was nervous of our chances leading up to the award because the other two games, Fauna and Pandemic, were very good in their own right. Fauna is a trivia game that focused on animal trivia, but the unique twist in the game was that you didn’t have to know the exact answer… you could score points for simply being close! The central idea was later used in the followup game, Terra – a game which used geographical trivia questions instead. 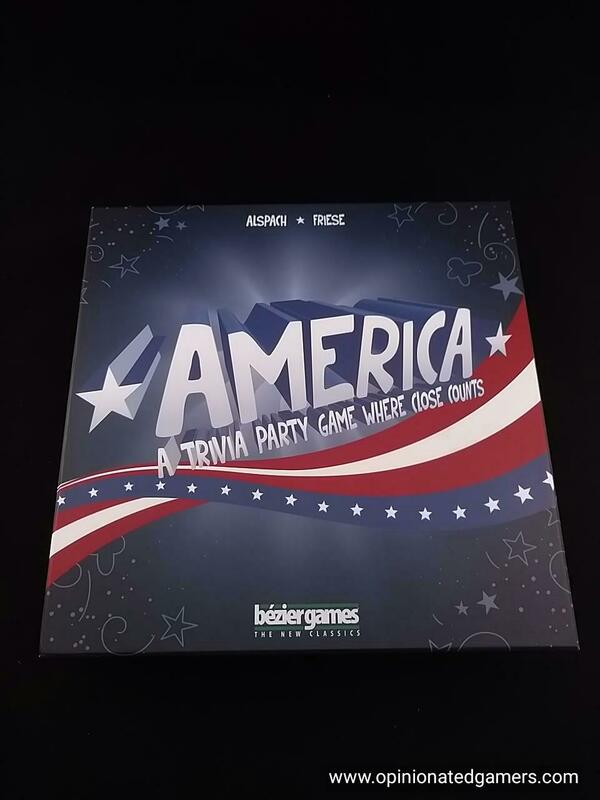 The third version of the game, America, focuses on…. 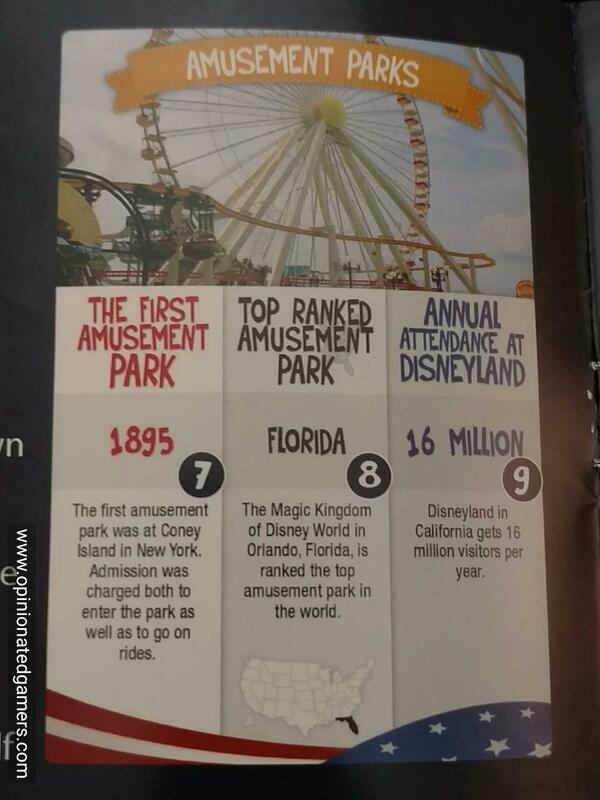 you guessed it, American trivia. 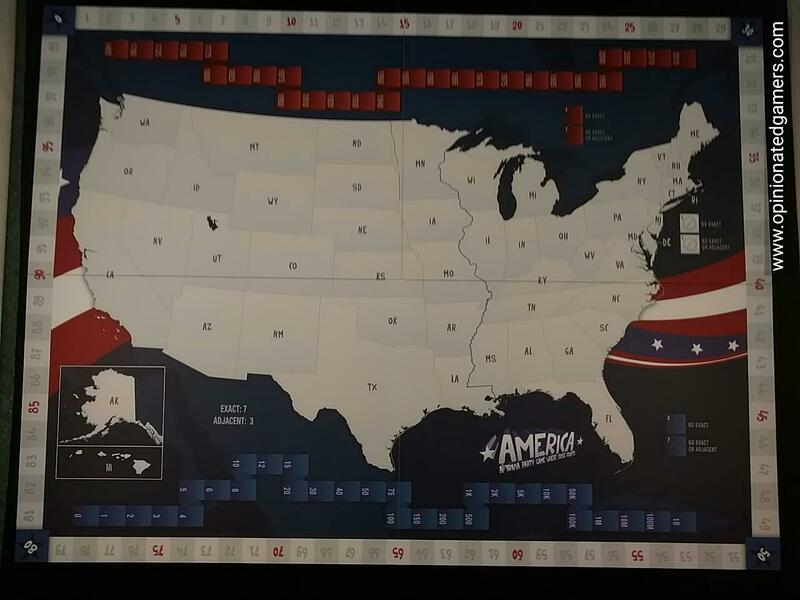 The board is a map of the United States, with all 50 states being shown on the board. 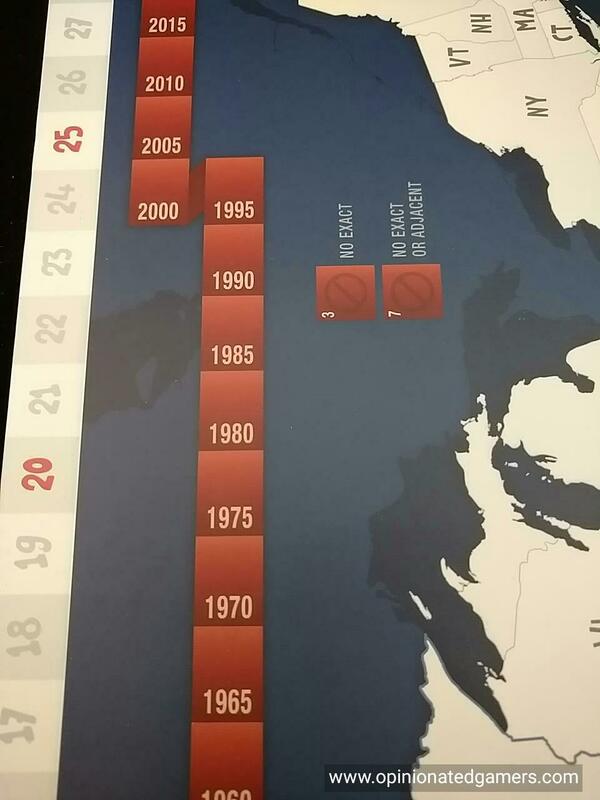 There are also two tracks surrounding the country, a red track with a timeline stretching from 1492 to 2015 and a blue track that offers numbers from 0 to 1 Billion. The rest of the game centers around a box of 160 cards that are kept in a half-height box. These cards contain the questions in America. At the top of each card, you will find the theme of the card. On the top half – which is the half that is visible when the card in standing in the box – are three questions. The format is the same on every card. The left question is a timing question – asking for a year as an answer. The central question is location based – asking for a state as an answer. The right question is a trivia question – asking for a number answer. The lower half of each card has the answer to each of the three questions as well as a little educational blurb about each answer. The cards are double sided, so you actually get 320 questions in the box! 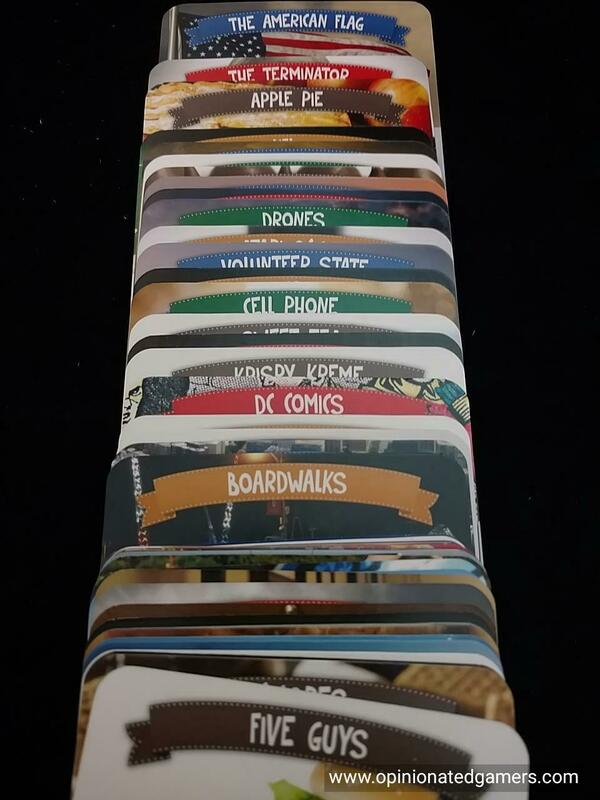 There is a divider card in the middle to put used cards behind. The game is played over 6 rounds. In each round, a single card is used – the start player for the round takes the box of cards, and without removing the cards, looks at the two cards visible at the ends of the box. That player chooses one of them and reads the theme of the card and then the three questions. The Location part of the card will also tell players whether the correct state is East or West of the Mississippi River. Then, starting with the player to the left of the starting player, each player may choose to place one of their answer markers on the board. You may only place your marker on an unoccupied space – but you may choose freely amongst any empty state, timeline space or numberline space. The goal is to place your marker on the space which is the correct answer, or at least on a space which is adjacent to the correct answer. For each of the three answer areas, there are also two special spaces for “No Exact or Adjacent” or “No Exact”. You may place your marker here if you think that no player has a cube on an exact and/or adjacent space. Each player has the chance to place one of their cubes or they can pass. If they pass, they may not place any more cubes this turn. Once all players have passed, then it’s time to score the round. To score, the card is now removed from the box so that the correct answers can be read. Each of the three questions is scored separately. For the year, the player who is in the space with the correct answer scores 7 points. Any player in a directly adjacent space will score 3 points. The same player may be able to score for both exact and adjacent answers if they had placed cubes in those spaces. You should also evaluate the two special spaces. If someone has chosen “No exact and adjacent” and there are in fact no correct answers in this category, that player scores 7 points. The “No exact” space will score 3 points if there is in fact no correct adjacent answer in this category. Next is the State question – which is scored in similar fashion. The only difference here is that there are likely more adjacent answers as many states have more than two neighbors. States that meet at only a corner point are not adjacent, and Alaska and Hawaii have a special relationship in this game in that they are considered adjacent to each other but not adjacent to any other state. Finally, score the Number question in the same manner as above. As each question is scored, any cube which scored points is returned to its owner as the points are marked on the scoring track. Any cube which did not score points is moved to the side of the board to a general supply. At the end of the round, each player may take one cube of their color from this supply. Additionally, any player who has fewer than 3 cubes after the re-supply may draw cubes to bring them up to 3. Finally, the card is placed just behind the red divider card – if the box orientation is maintained, the back side of the card will now eventually come up on the other side of the box at some point. The box is now passed to the next player clockwise around the board, and another round is played. This continues until six rounds have been completed – at that point, the game is over, and the player with the most points wins the game! If there is a tie, the player with the most markers left in their supply is the winner. If there is still a tie – all tied players play one more card as a sudden death tiebreaker. As I mentioned at the top, I’m a big fan of this entire series of games – the previous two, Fauna and Terra, have places on my permanent game shelves. This new version is a great addition to the series, and one that definitely also deserves a place on any trivia buff’s game shelf. The scoring system of the game allows players of all knowledge levels to compete. Sure, like any trivia game, knowing the correct answers will help you win the game. However, as adjacent answers can also score points, if you think that someone else knows the right answer, you can try to place your cubes adjacent to theirs and try to ride their coattails. The question topics span a wide variety – I have tried to avoid rifling through the card deck because I don’t want to have an advantage over other players when we play the game – but in the four games that we’ve played so far, the questions have been interesting and quite varied. There have been more than a few questions that no one knew the exact answer to – and that highlights the biggest difference in America from the other two games in the series. The “No Exact” and “No Exact or Adjacent” spaces are a very nice addition to the rules. While it doesn’t happen often, there are some questions that simply stump everyone. These new spaces add an extra dimension to those difficult questions. For our group, this has mostly happened on the Number questions, but we’ve actually had one State answer that no one knew! The other novel part of the game is the two sided cards and divider in the middle of the cardbox. This system makes it easy to continue to recycle the cards and ensure that your chance of seeing the same card twice is remote. With 320 possible cards in the game, and only 6 being used in any game, you would need to play 50+ games before seeing a repeat card. The game plays quickly, and our games usually take about 30 minutes. This seems to be just the right time for the game. While it may seem that this is the sort of game that could produce a runaway winner, I’ve seen players score 25+ points on a single card when they knew the answers (and no one else did). Is this my favorite game in the series? Actually, I don’t think I could say that I like any one of them more than the other. Each of the games is challenging in its own right, and it may depend whether we feel like contesting over animals, geography or American History. I like the addition of the “No Exact” spaces, but this version of the game does seem to be less open to non-Americans. I mean, sure, you could play this with a European, but the knowledge here is obviously limited to American facts, and anyone from the USA will have a distinct advantage over a non-American. In any event, being an American, this game is right up my alley, and one that will get lots of play. It’s a great game for families as it is easy to teach and just about anyone can participate. Erik Arneson (3 plays): America is definitely my favorite game in the series. Fauna and Terra are excellent, but America is exceptional because of the variety of topics covered in the game, the addition of the “No Exact” and “No Exact or Adjacent” options (and the added strategy of deciding when to play there), and the nice way the cards are played and then cycled back into the box. One detail that shows how much thought was put into the design elements is the fact that most of the cards are designed so that similar topics are covered on both sides. One card, for example, has facts about Space Invaders on one side and Asteroids on the other. (Other examples: Abraham Lincoln / Andrew Jackson, LED lights / fiber optics, and Prozac / crystal meth.) Because of the way the cards are cycled with the divider in the middle, this greatly reduces the chance that you’ll get such similar topics in a single game. I totally understand Joe Huber’s point below about one of the appealing things with Fauna being that most players didn’t actually know very many of the answers. I appreciated that about Fauna, too, but it was definitely a source of frustration for some other players. For me, America strikes a great balance between questions that people might know, those that lend themselves to educated guesses, and those that are pretty much a (fun) leap in the dark. I’ll gladly pull America off the shelf any time. Even on Syttende Mai. Joe Huber (2 plays): Trivia games don’t generally capture my interest, but Fauna did better with me than most. The ability to be inexact, and to guess usefully, makes a big difference. But what really made the game was the fact that I played with no one who really knew the answers – or at least not all of the answers on any particular card. Unfortunately, that seemed less often the case with America – the subject is simply a little more open to players knowing all of the answers for a particular card. Having said that, the game is still enjoyable, if not the type of game I’d choose to pull out often enough to fit well in my collection. I’m sure I’ll play other’s copies now and again, however. Mary Prasad (2 plays): The game was fun to play but playing with 5 or 6 means a lot of answers are taken before it gets back to your turn (not to mention more down time). I’d like to try it with 3 or 4. Doug Garrett (3 plays): I used to be ‘that guy’ back in high school who read through all of the Trivial Pursuit cards, though we rarely played the actual game. Ted and Friedemann’s game works perfectly for 4 players, and nicely with fewer or more. This one will find its way to the table with non-gamer couples and definitely see play with my students at school. I’ve done Terra with partners at school (more students involved) with great success, so this one will find its place there as well. Greg S.: Fun Trivia game that plays in a short period of time. I do enjoy how even those who aren’t trivia buffs can still compete. The “America” version certainly should appeal to a wide market here in the U.S. I like it. Mary Prasad, Greg S.
This entry was posted in Essen 2016, Uncategorized. Bookmark the permalink.